Unity Tool Case Studies - Unity Tool Inc.
Our capabilities are best illustrated through real-life examples. Over the years, we have been met with many exciting projects that challenged us and we have always striven to deliver precision and exactness, while maintaining a close relationship with the customer. Read our Case Studies to get a sense for our breadth, our abilities, and our process. For our newest case study, we combined vision technology with a surprise pop, investing in the right equipment to keep Unity’s production moving swiftly. A customer came to us needing a high quantity of their part, which we could certainly handle with our robotic mill. The challenge was that the pieces needed to be loaded one-by-one on a conveyor by a technician to feed the robot, defeating the purpose of robotic labor. The Challenge: In order to keep costs down, we needed to get the pieces loaded into the machine without using staff time to do it. We had two options. One was to use a vibratory bowl feeder, but these are dedicated for use with only a certain family of parts. We needed something more universal. The other option involved a vision system which would work with our existing robot. Here’s how we solved the challenge: we load a hopper of the parts, which slowly move down a conveyor belt to a shaker table. 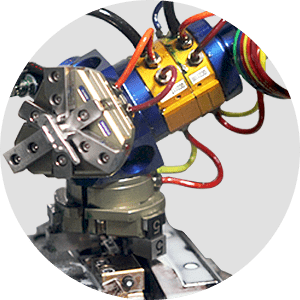 The table systematically shakes or pops the pieces, while a camera eye identifies which pieces have fallen in the right configuration for the robot. 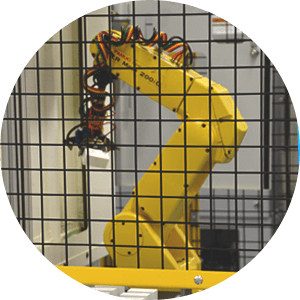 The robot is told which pieces are turned the right way to be loaded and milled, and it picks those up at a rate of under 15 seconds per piece. When those pieces have been loaded, the table does its shaky work again, and the vision system tells the robot which are next to be picked up. 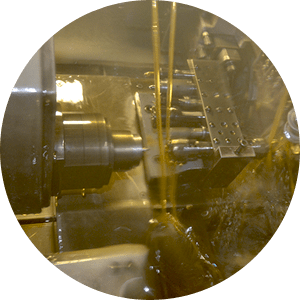 Using a vision system, a feeding mechanism, a shaker table, and a hopper/conveyor, this process is able to continue after-hours, and at a rate quick enough to deliver thousands of parts. 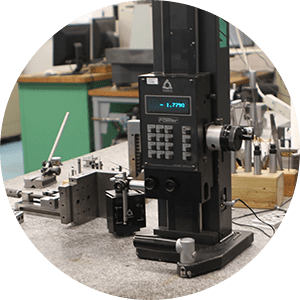 This customer was pleased with the repeatability of the process, and we at Unity were happy we could meet their target pricing and find a solution that can save time and labor on these types of projects. We’ve all worked with vendors or companies who make your life harder instead of easier, and it becomes time to turn to other companies that will work with you to solve your problems instead of brushing them off. A major medical customer had trusted another manufacturing company with their product, only to have problems with parts failing in the field, costing them roughly $5,000 per instance. This vendor was not interested in helping to solve the problem or reduce the number of seal failures, and had trouble delivering parts on time. The problem with the part was due to an incorrect surface finish on the piece. Working closely with the customer, Unity experimented and ran test runs of alternative surface finishes to find what would work best. After months of diligence and careful testing, Unity and the customer found the right answer and could begin implementing the fix. With this newly-revised product, we needed to incorporate new inspection processes to ensure those failures would not be revisited. 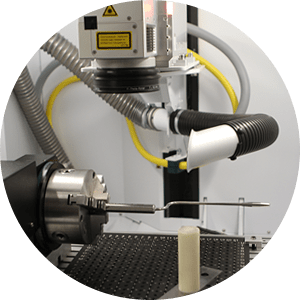 At first it seemed painfully obvious that the piece would require automated rounded equipment to check concentricity, meaning inspection of the piece would require specialty equipment and cost thousands. The outlook was dismal. And expensive. Unity’s team, however, had a hunch that there was a better way. Working closely with the customer’s engineers, it was discovered that another existing piece could be used to inspect the part without needing specialty equipment. Thinking outside the box saved money for both the customer and Unity, and the piece is now ensured to be successful. The demand for these particular parts varies greatly from month to month. The customer was frustrated that the previous manufacturer wasn’t able to address this situation and it was an ongoing problem. 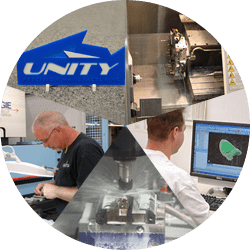 Unity has since worked with the customer to develop a delivery schedule so they will always have parts delivered on time, regardless of the fluctuations in the market. This customer is one of several that makes use of a Kanban system, a ship-to-stock agreement that allows Unity to monitor inventory and deliver pieces directly into the customer’s stock when they are needed. Unity has always delivered these parts on time, and continues to do so today. Many times customers will come to Unity when they need help completing the processing on a particular part. We step in, fulfill that need, and get the customer’s pieces on their way. In this case, a metal-injected molded part, called an extractor, needed an additional machining operation to finish it, but both the target price and tolerances were extremely tight. How could Unity finish the needed part while ensuring the right tolerances and staying under a pre-determined price? After research and weighing options, Unity decided to purchase a new high-speed mill with robot loader system that would be able to address the part needed, but also run autonomously, making it possible to manufacture the high quantities needed. • With the ability to deliver thousands of these pieces to the customer every month. Sometimes the solution is right in front of you. Unity manufactured two pieces of a three-piece assembly for a customer, which the customer then assembled themselves. While Unity manufactured the components to print, the stacking up of tolerances in assembly lead to the part being unreliable. Naturally, the customer wanted to revisit the design and improve part consistency, but not increase costs. The Challenge: Find the problem & redesign the piece while maintaining current production costs. Being a gage ring, the part required very tight tolerances. Unity’s team of engineers went back to the drawing board with the customer on this piece. Is the design of this assembly as clean as we can get it? Could it be modified to fix the alignment of the third piece? What would we do if we were designing this from scratch? Fortunately, it was discovered that the two pieces that Unity was already producing could be modified to eliminate the need for the third piece entirely. Even better, the modifications to the design led to overall higher tolerances on the finished assembly. Results: The new two-piece assembly costs the customer less money, holds tighter tolerances, and provides more consistent quality for the customer. 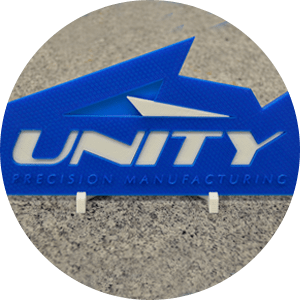 What’s more, Unity offered to take on the assembly process as well, lightening the customer’s work load and allowing them to only inventory their finished assemblies. A hunting accessory supplier came to us with complaints about their current manufacturer. There were two problems: parts were not being delivered on time, and the supplier was not responsive to requests for information. Not the best relationship. This customer came to Unity wanting to switch manufacturers and get their parts delivered on time, while staying within budget. But they did not have prints for their product. Time was ticking and their seasonal product needed to be reverse-engineered and produced immediately for that season’s sales. As part of the print process, Unity helped tolerance the prints so that the parts would fit, and yet not be over toleranced making them more expensive to manufacture. Pricing was confirmed in the customer’s range, and they were free to begin the production process. Unity was given the green light, and all parts were produced to print, within the price range, and delivered in time for the sensitive seasonal nature of the product. Unity continues to fulfill these orders, and has gained a valued customer through this process. Another customer had several large medical instrument projects, and were interested in adding an additional small project: five sizes of a single instrument, 2-3 times a year. It turns out that larger manufacturing companies were not interested in this smaller project, and turned away the opportunity. At Unity we are less concerned with whether your project is too big or too small. We are interested in working with customers to solve problems and get their parts done right, not play Goldilocks and look for just the right-sized project. Good customers keep us going, plain and simple. Unity was able to work with this customer to take on their projects. We refined the print to function the way the customer needed, and we worked to find a process that would deliver the desired finish while staying within budget. We even package and label these parts for the customer. A project that was not of great interest to a larger supplier has turned out to be an ongoing successful relationship. And no one had to eat any porridge.